Whenever a group of young musicians (in this case a guitar-led quartet from Montreal) makes its recording debut, a number of questions quickly arise. First and foremost, can they play? Check. Do they swing? Check. Is the music bright and refreshing? Check. Are they sharp and enthusiastic? Check. Do they blend well as a team? Check and check again. 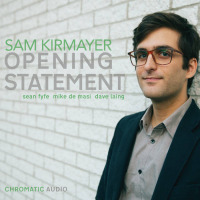 Having checked all the boxes, guitarist Sam Kirmayer and his colleagues produce an Opening Statement that boldly announces their arrival and bodes well for the future. Kirmayer, who started playing the guitar (rock division) at age seven and was nudged toward jazz by a music teacher in college (he graduated from Montreal's McGill University in 2016), lists Wes Montgomery and Grant Green among his influences, and nods to them on the album with his original composition "Synecdoche" (after Montgomery's "Four on Six") and the standard "For All We Know," a tribute to Green that is played not as a ballad but a groover that hurries from the starting gate and sprints to the finish line. Kirmayer also salutes fellow guitarist Peter Bernstein with the easygoing "One for Pete" (which embodies tasteful solos by Kirmayer, New York-based pianist Sean Fyfe and bassist Mike De Masi who then trade fours with drummer Dave Laing). Kirmayer also wrote "Jiro's Dream" (for a master sushi chef) and the hard-swinging "Opening Statement," which is positioned not first but last on the menu. Kirmayer displays his exceptional chops on that one, as he does throughout the session. Fyfe is another sharp improviser whose mastery of the keyboard is consistently impressive. As for De Masi and Laing, each one solos nicely when called upon while lending inflexible support to Kirmayer and Fyfe. As manifestos go, Kirmayer's Opening Statement is strong-minded, well-spoken and worth relishing many more times than once. Track Listing: Synedoche; For All We Know; Jiro’s Dream; Resonance After Dark; My Shining Hour; The Night We Called It a Day; One for Pete; Opening Statement. Personnel: Sam Kirmayer: guitar; Sean Fyfe: piano; Mike De Masi: bass; Dave Laing: drums.